Narrow Neck Plateau is a large sandstone-cliffed peninsula of rock that divides the Jamison Valley and Megalong Valley south of Katoomba. It juts about 13km out towards the Coxs River and the upper part of Warragamba Dam. 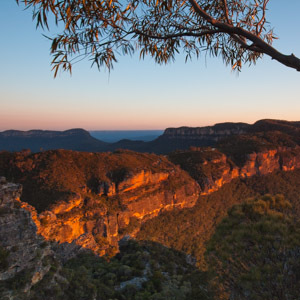 It used to be a popular bushwalking area early in the 20th century due to the easy access from Katoomba providing a route into the Wild Dog Mountains and beyond. With the rise of the motor car it started to lose popularity, and with the construction of the fire road out to Clear Hill in about 1960 bushwalkers moved on to more pristine areas. In recent years it has experienced a bit of a resurgence of interest, mainly around the passes on to and off the plateau. From the bottom of the main shopping street in Katoomba, continue along Katoomba St for about 800m and veer right into Katoomba Falls Rd. After you reach the bottom of the hill, veer left into Cliff Dr. Follow Cliff Dr as it winds past a number of lookouts - Eaglehawk Lookout, Landslide Lookout, Cyclorama Point and Hildas Lookout - and then turn left into Glenraphael Dr, which immediately turns into a dirt road. The road is generally fairly good quality, although there are a couple of large ruts at point which may be awkward for cars with low clearance. There are several parking areas. The main ones are at the Golden Stairs, after about 1.8km, and at the locked gate at 2.6km. It is possible to walk from Katoomba Station but it is about 2.5km to the top of Glenraphael Drive and about 5km each way to the locked gate. There are buses from the station to places where it would be a shorter walk. There are a couple of well known multi pitch abseiling trips in the vicinity of Narrow Neck. The Castle Head abseil descends an old miners route in about five pitches. Boars Head abseil is a classic trip that descends a series of gullies and ledges below Boars Head Rock, near the Devils Hole. The highlight is a traverse through a narrow slot with a 50m drop below your feet. Both trips involve a significant amount of exposure. The main focus of bushwalking on Narrow Neck these days is rediscovering the old passes. These were typically old miners' passes, and some of them were equipped with wooden ladders. Few of the original ladders remain and many passes require rope to negotiate fully. Major bushwalking passes include (clockwise) the Golden Stairs, Walls Pass, Taros Ladder, Dunphys Pass, Mansons Ladders (Carlons Head), Mitchells Pass and Red Ledge Pass. There is a significant amount of rock climbing on Narrow Neck, although perhaps not that much when you consider the amount of rock available. The climbing is mostly on the western side, within a short walk of the drivable part of Glenraphael Drive. There are several climbing areas, with a variety of styles. Diamond Falls is steep, overhung sports climbing. The main wall has mostly trad or mixed climbs in the lower to middle grades, spread out over a couple of kilometres. The Red Ledge has a few sports climbs. Rhum Dhu, around the Devils Hole area, has some older rambling routes that are hard to find these days. The ride out to Clear Hill at the southern end of Narrow Neck is an excellent ride. It is about 13km each way from the start of Glenraphael Drive. There are superb views from a number of vantage points, a few steep hills, and some more technical sections out near the end. 360 degree views from the top of the Ruined Castle, one of the best easy day walks in the Blue Mountains. An excellent overnight walk with good views of Lake Burragorang and beyond, and options for camp cave camping.